The destiny and memories of landscapes is a human responsibility. We choose what to know and what we want to remember. Landscapes, therefore, are political sites. Since 1923, 165 square kilometres of mountain landscape on the slopes of Snøhetta, situated more than 1,000 metres above sea level, have been used as a military test site and shooting range for the Norwegian army and NATO. It is probably one of the most heavily bombed landscapes in Norway. However, the entire area is to be restored to its natural state by removing all traces of military activity. Committing more than 60 million Euros to the project, the Norwegian Defence Estates Agency has named it Back to Nature. The hole in the ground is obvious, and does not seem to belong here. Everything around it is overgrown with low vegetation; even the rocks around it are covered in moss and lichen. The surrounding landscape is wild and rugged, without any trace of human activity. The area measures about 1 metre across and is just as deep. It is as if the ground is missing a piece, as if there is an abyss down there where sand and rocks are leaking out, or as if someone has started digging for something, throwing rocks and sand over the edges, but has given up in the process. There are no traces of a meteor or alien presence; there are only rocks and sand. Highway E6 runs across the Dovre mountain range, and from the village of Hjerkinn a gravel road takes off into the wilderness surrounding Snøhetta. The mountain measures 2,286 metres in height, and was for a long time regarded as the National Mountain of Norway. This is where the shooting range is situated. 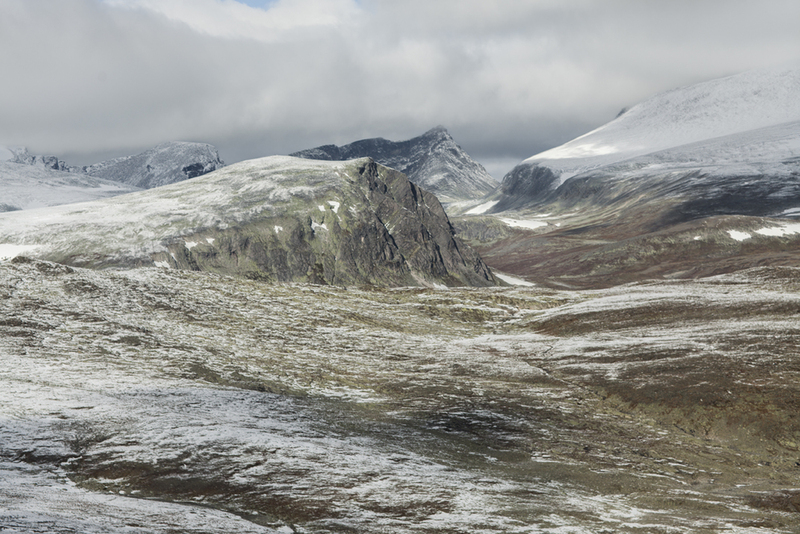 The Dovre Mountains are home to one of the largest populations of wild reindeers in Europe, the animals being one of the main reasons why this country was first inhabited some 13,000 years ago. The mountain plays a significant role in both Norway’s history and its origin myths. 200 years ago, at Eidsvoll in 1814, the constitutional founders swore allegiance with the oath ‘Enig og tro til Dovre faller’ (United and faithful till Dovre falls). The oath, placing the mountains at its centre, expresses what these men must have felt to be the essence of the ‘Norwegian’ – wild, natural, constant and eternal nature. The potential of wild nature to form the basis of the construction of a national identity was expressed through national romanticism in the years following 1814. Today, 200 years after the renowned oath, wild nature still holds an undisputed position as a cornerstone in the national identity of Norway. It looks like a road, but it can’t be, because there is no bridge across the river. The road seems to cross it, but even now in summer when the stream is slow, there is no way of getting across the river. Obvious parallel tracks going down to the river on one side, and emerging again on the other shore remain. There might have been a bridge here at one time, but now there are no traces of such a construction, and the tracks clearly run all the way out into the water. They are wide and far apart from each other. It is as if a giant has marked the spot with an enormous stick, carving out two lines despite all natural formations. There is an obvious ambivalence between the image of modern Norway as a nature-loving, peace-promoting nation, and its large-scale export of weapons and arms and increasing military contribution to armed conflicts around the world. In the last twenty years, Norway has performed numerous peace negotiations. This has contributed to a national identity based on an image of ourselves as peaceful and good by nature. It is not surprising, therefore, that the restoration of this mountain is so popular and undisputed. Almost the entire area is being manually searched three times over by military personnel and dogs, to detect and remove explosives and other hazardous waste. Unmanned trucks and excavators knead the desolate mountain landscape and remove what is no longer wanted. In explosion-proof bunkers, often far away, these machines are controlled with millimetre precision by GPS and remote-controlled cameras. All traces of metals and fuels are either buried or sent away for destruction outside Norway. 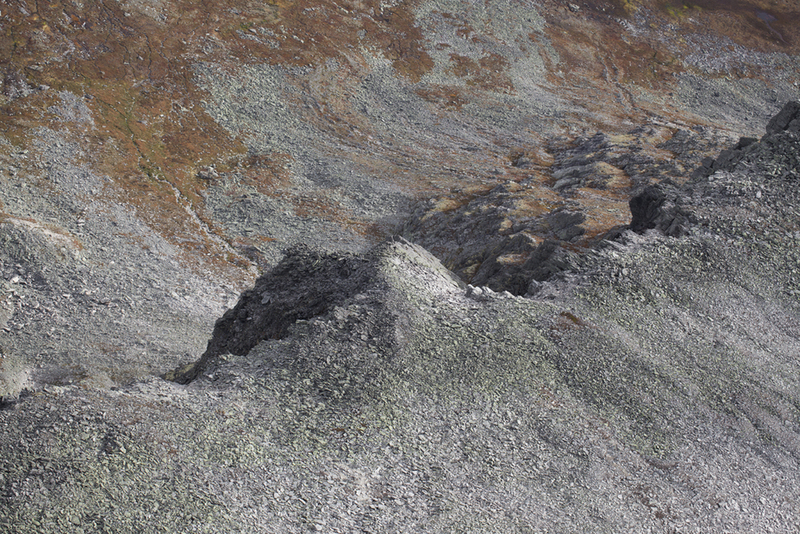 Some of the contaminated mass is being buried deep down at Hjerkinn and covered with gravel and soil to mimic natural forms in the landscape. At other sites, seedlings of the local flora are being planted out to reinforce the restoration process. The large surface is enormous, even in this wide landscape, with perfect constructed outlines. It is an absolute rectangle, covered by gravel. The surrounding mountains leap gently down towards the valley where the square is situated, and they do not seem to belong to the same image. The square looks like a landing site for spaceships from alien galaxies. There is a small gravel road leading to the perimeter of the square, and there are traces of what must be vehicles scattered over it. In the middle you can see something that could be a small village made out of mud huts, but at closer range it is obvious that they are mounds of soil, each exactly the same size. On some of them green grass has started to grow. Apart from that, the square is desolate, without any vegetation. The project has a moving aspect, both from an ecological perspective – its belief that nature can be restored – and because of its desire to deal with the more brutal side of the modern and official Norway. The restoration of nature at its core, aiming to minimise the damage done by humans and re-establish ecosystems, has good intentions. 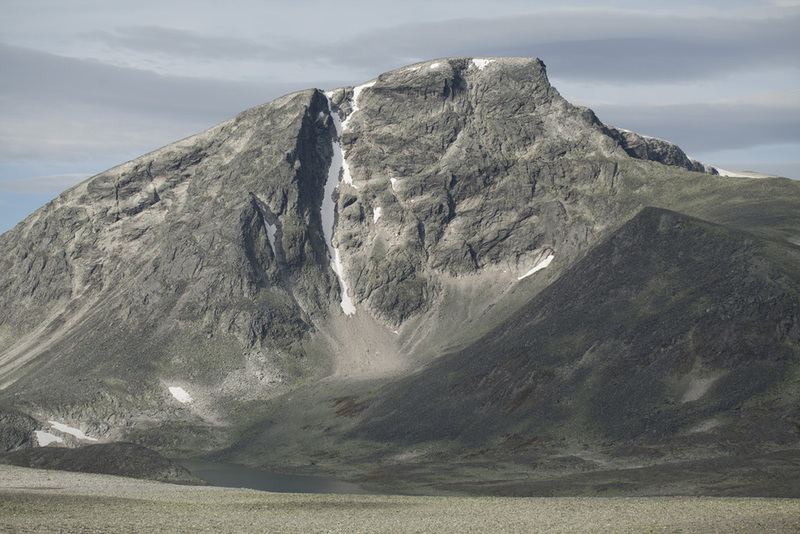 But the project going on at Dovrefjell has other perspectives: it is not only nature, as genuine and untouched as we could imagine, that is being reconstructed, but our very idea of Norway and the way we want it to be. www.andreasbennin.com Upcoming shows: Skjønne sjeler, Seljord kunstforening, end of june - august 2014. Til Dovre faller, Lillehammer kunstmuseum october 2014.